What is Glen Carr House Memory Care’s LEGACY Program? 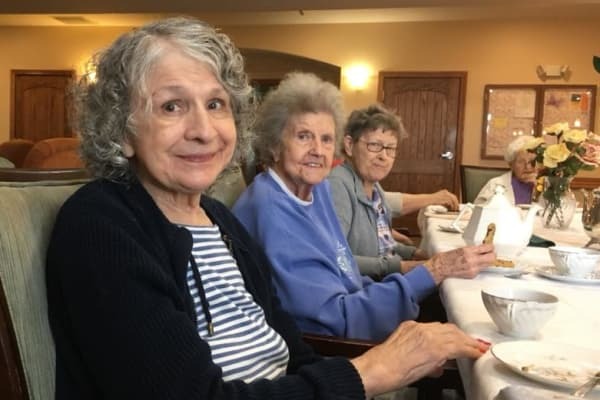 LEGACY Program is about building community by creating individually tailored experiences and sharing them with residents to enrich their lives. This all-inclusive, life-engagement program is staffed by our life engagement team seven days a week. This team is solely dedicated to our resident personal development and community building, via this groundbreaking program, plus it’s supported by certified caregivers at all levels. In this mode we help residents use expression to add meaning and purpose to their life and those around them. Art, including music and writing, can bring into focus an important view of a person’s life and give them chances to speak through self-expression, self-exploration, and self-interpretation. Expression is the light we all have. It’s finding it again that is sometimes the trick. LEGACY finds a way and makes programming around expression a core part of the week, the day and the moments with our residents. When a person is aging they can become isolated and distant from people. We find ways to bring individuals together in numerous social spaces, specially designed for movement and social interaction, taking place throughout the building.We also use the latest in interactive technology and find ways to create synergy within the community and with the families of the residents. We are committed to keeping families part of care and part of our team of experts. New Home. New Neighbors. New Relationships. Learning to come together with a whole new group of people and make meaningful times with one another is a HUGE part of LEGACY! Glen Carr House Memory Care is interested in the health of our residents. By engaging this part of the LEGACY model in daily living, residents are encouraged to exercise not only their mental health but their physical health as well. Active is the basis for keeping moving so that bodies and minds stay in harmony. Active people are happy people. We strive in any way we can to keep residents active, engaged and moving physically. Every step is a step toward health – even at 99. We want to make a difference in how the meaning of community is redefined – through interaction and development within our building, our extended family and our city. We are a community hub that gives back too, being involved with day cares, high schools, nursing schools and colleges. Building a community is not just an idea we toss around. We take every day as an opportunity to create that sense of home and make your home a place people love to come visit and live. Growing the bonds between generations can lead to an extension of the legacy that a person can leave. The interaction that we can do with youth and elders enriches lives and our program over that long haul. Building a bridge with our residents to young people is a goal of LEGACY. The wisdom, stories and life they have to share is vast and often very interesting.